Explore the interior of the Old Faithful Inn and truly take a step back in time. The Old Faithful District in Yellowstone holds much of the park's history. Since 1897, the Lower Hamilton Store is the oldest structure in the Old Faithful area still in use. Old Faithful Inn represents the asymmetry of nature’s chaos as designed by Robert C. Reamer, built in 1903. 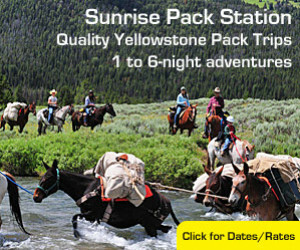 Old Faithful Lodge offers cabin-style accommodations today and began as a series of tent camps in the early 1900s. Built in the winter of 1903-04, Old Faithful Inn represents the asymmetry of nature’s chaos as designed by Robert C. Reamer. The hotel lobby features a 65-foot ceiling, a massive rhyolite fireplace, and contorted lodgepole pine railings. Wings were added to the hotel in 1915 and 1927. There are 327 rooms for guests in this National Historic Landmark, currently operated by Xanterra Parks & Resorts. Unlike the Inn, the current Old Faithful Lodge dates back to the early days of tent camps provided by companies like Shaw and Powell Camping Company and Wylie Permanent Camping Company. In 1918, a laundry was built on the site and construction continued on the facility until 1928 when the Lodge reached its present configuration. Cabin-style accommodations are available at Old Faithful Lodge, currently operated by Xanterra Parks & Resorts. 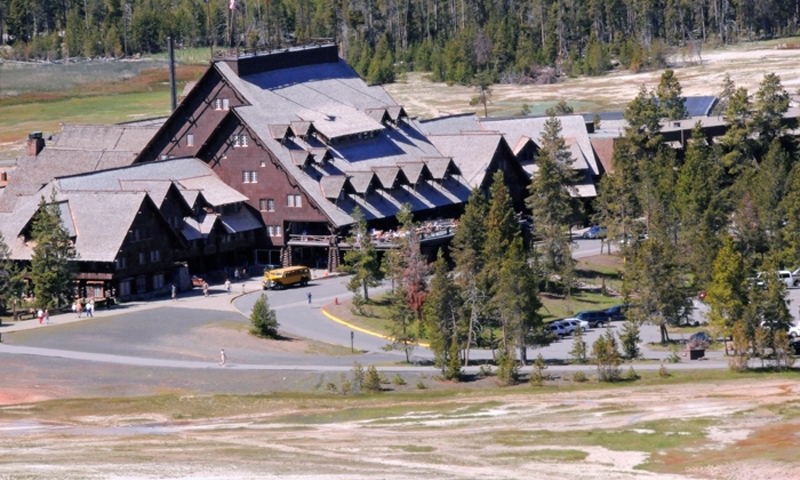 Often confused with the other two hotels in the area, Old Faithful Lodge houses a cafeteria, gift shop, coffee shop, and the front desk where guests check in. Built in 1897, Lower Hamilton Store is the oldest structure in the Old Faithful area still in use. The knotty pine porch is a popular resting place for visitors and provides a great view of Geyser Hill. Built in 2010, the Visitor Education Center features a number of exhibits on the park's geothermal activities. There is also a fantastic movie room and gift shop. Join a Ranger Led Program and learn about the area's history.